The architects tell a story about Proust – and one Puma. With grandeur, glamor, grace. And a lot of green! Wenn man nach der Vergangenheit sucht, dann hilft manchmal ein Bild. Ein Farbton, die Struktur einer Oberfläche, ein Geruch, und plötzlich findet man sich an einem anderen Ort wieder, der verloren schien und mit einem Mal und voller Wucht wiederkehrt. Ungefähr so fühlt es sich an, wenn man das jüngste Projekt von Andrea Marcante und Adelaide Testa. Ungewöhnlich ist es schon, weil es sich um eine Mietwohnung handelt, in bester Lage freilich, gleich neben Mailands Parco Sempione. Nur wenig griffen die Architekten aus Turin deshalb in die Substanz ein; der Grundriss, die alten Holztüren, der schlichte Stuck, die bodentiefen Fenster, das Parkett – all das blieb unangetastet. Das Konzept, das Marcante und Testa entwickelten, hat es trotzdem in sich, auch weil sich Architekten und Auftraggeber blind vertrauen. Die vier kennen sich seit 30 Jahren, „Le Temps retrouvé“ ist UdAs fünftes Projekt für Isabella Errani und Marco Lobina. Durch bodentiefe Fenster fällt der Blick in einen kleinen, wild begrünten Innenhof. „Im Sommer könnte man meinen, man sei im Wald“, erzählt Marcante. Dann ist draußen alles grün, die Nachbarhäuser nur eine Ahnung. Inmitten der pulsierenden Großstadt bildet der Hof eine stille Oase – für Bewohner und Architekten das eigentliche Key-Feature der Wohnung, das sich im Inneren in kräftigem Grün, blumigen Tapeten und viel Tageslicht fortsetzt. schwergewichtig ausfallen. Bei UdA fühlt es sich leicht an. Und nie allzu ernsthaft. Die Marmoroberfläche des Esstischs etwa, die sich bei näherem Hinsehen als eine laminierte MDF-Platte auf Hay-Tischböcken entpuppt. Oder der ausladende Rattansessel im Wohnzimmer, ein Gio Ponti-Klassiker, in dem Sylvia Kristel 1974 als „Emma nuelle“ einen kleinen Skandal auslöste; Reverenzen, die die beiden stets augenzwinkernd und mit leichter Hand einsetzen. Gut drei Monate dauerte das minimalinvasive Projekt mit knallbuntem Ausgang. „Es braucht nicht immer Wände, um Raum zu strukturieren“, erklärt Marcante und deutet auf den farbigen Kunstharzanstrich auf dem historischen Fischgratparkett. „Fast wie ein Teppich“ – und ein naheliegendes Element, immerhin hat sich die Firma des Hausherren auf ebensolche Beschichtungen spezialisiert. 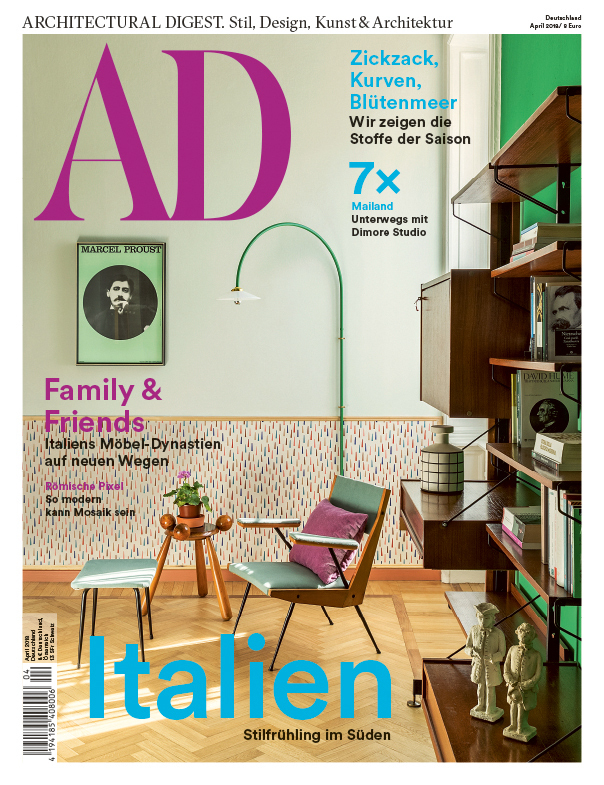 Die Küche verlegten die Architekten aus dem heutigen Gästezimmer ins Wohnzimmer. Die Fronten in fröhlichem Hellblau mit korallenroten Griffen sind aus „Polaris“-Laminat, einem synthetischen Mischmaterial mit feiner Marmorierung. 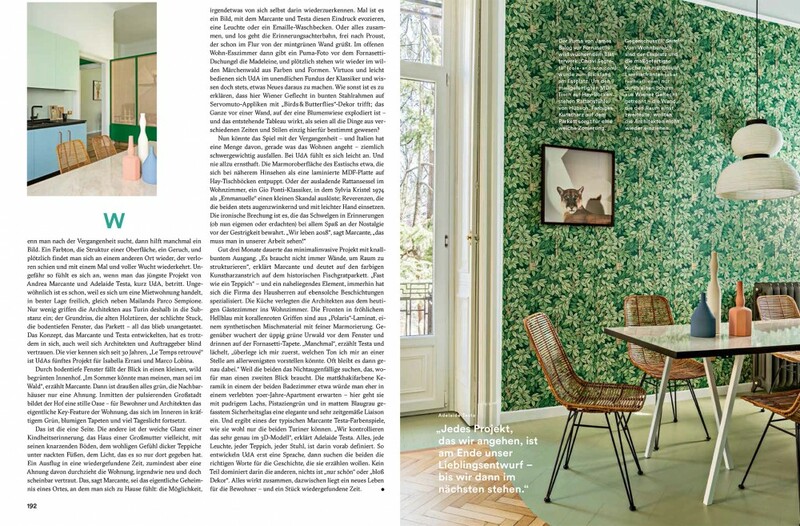 Gegenüber wuchert der üppig grüne Urwald vor dem Fenster und drinnen auf der Fornasetti-Tapete. „Manchmal“, erzählt Testa und lächelt, „überlege ich mir zuerst, welchen Ton ich mir an einer Stelle am allerwenigsten vorstellen könnte. Oft bleibt es dann genau dabei.“ Weil die beiden das Nichtaugenfällige suchen, das, wofür man einen zweiten Blick braucht. Die mattkhakifarbene Keramik in einem der beiden Badezimmer etwa würde man eher in einem verlebten 70er-Jahre-Apartment erwarten – hier geht sie mit pudrigem Lachs, Pistaziengrün und in mattem Blaugrau gefasstem Sicherheitsglas eine elegante und sehr zeitgemäße Liaison ein. Und ergibt eines der typischen Marcante Testa-Farbenspiele, wie sie wohl nur die beiden Turiner können. „Wir kontrollieren das sehr genau im 3D-Modell“, erklärt Adelaide Testa. Alles, jede Leuchte, jeder Teppich, jeder Stuhl, ist darin vorab definiert. So entwickeln UdA erst eine Sprache, dann suchen die beiden die richtigen Worte für die Geschichte, die sie erzählen wollen. Kein Teil dominiert darin die anderen, nichts ist „nur schön“ oder „bloß Dekor“. Alles wirkt zusammen, dazwischen liegt ein neues Leben für die Bewohner – und ein Stück wiedergefundene Zeit. When looking for the past, sometimes a picture helps. A hue, the structure of a surface, a smell, and suddenly you find yourself in another place that seemed lost and returns with a single stroke. That’s the way it feels when you enter the latest project by Andrea Marcante and Adelaide Testa. Unusually it is, because it is a rented apartment, in a prime location, of course, next to Milan’s Parco Sempione. Therefore, the architects from Turin did not make much use of the substance; the floor plan, the old wooden doors, the simple stucco, the floor-to-ceiling windows, the parquet – all this remained untouched. The concept, which Marcante and Testa developed, is nevertheless impressive, also because architects and clients trust each other blindly. The four have known each other for 30 years, “Le Temps retrouvé” is their fifth project for Isabella Errani and Marco Lobina. Through floor-to-ceiling windows the view falls into a small, wildly landscaped courtyard. “In summer you might think you are in the forest,” says Marcante. Then everything is green outside, the neighboring houses just a hunch. In the midst of the pulsating city, the courtyard forms a quiet oasis – for residents and architects the real key feature of the apartment, which continues inside in rich green, flowery wallpaper and plenty of natural light. That’s the page. The other is the soft glow of a childhood memory, the house of a grandmother perhaps, with its creaking floors, the comforting feeling of thick carpets under bare feet, the light that has only been there. An excursion into a rediscovered time, or at least an idea of ​​it pervades the apartment, somehow new and yet seemingly familiar. That, says Marcante, is the real secret of a place where one feels at home: the possibility of recognizing something of oneself in it. Sometimes it is a picture with which Marcante and Testa evoke this impression, a lamp or an enamel sink. Or all together, and off you go the commemorative rollercoaster, free to Proust, who greets in the hallway from the mint green wall. 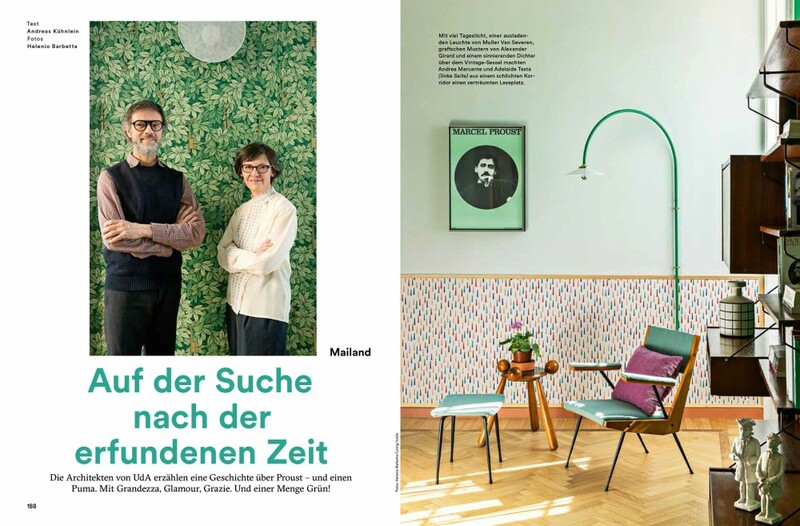 In the open living-dining room, a puma photo in front of the Fornasetti jungle gives the Madeleine, and suddenly we are standing in the wild fairytale forest of colors and shapes. Virtuoso and light, Marcante-Testa make use of the infinite collection of classics and always know how to make something new out of them. How else is it to explain that here Viennese netting in colorful steel frames meets Servo Muto appliqués with “Birds & Butterflies” decor; The whole thing in front of a wall on which a flower meadow has exploded – and the resulting tableau seems as if all the things from different times and styles were intended solely for this purpose? Now playing with the past – and Italy has a lot of it, especially in terms of living – could turn out to be pretty heavyweight. It feels easy at Marcante-Testa. And never too serious. The marble surface of the dining table, for example, which on closer inspection turns out to be a laminated MDF board on Hay benches. Or the expansive rattan armchair in the living room, a Gio Ponti classic in which Sylvia Kristel caused a minor scandal in 1974 as “Emmanuelle”; as a tribute, the two always use with a wink and with a light hand. It is the ironic refraction that keeps reminiscing (whether personal or imagined) of all the fun of nostalgia from the stasis. “We live in 2018,” says Marcante, “you have to see that in our work!” The minimally invasive project took a good three months with a colorful finish. “It does not always take walls to structure space,” says Marcante, pointing to the colored resin coating on the historic herringbone parquet floor. “Almost like a carpet” – and an obvious element, after all, the company of the owner has specialized in such coatings. The kitchen has been moved by the architects from the present guest room into the living room. The fronts in cheerful light blue with coral handles are made of Durat, a synthetic blend material with fine marbling. 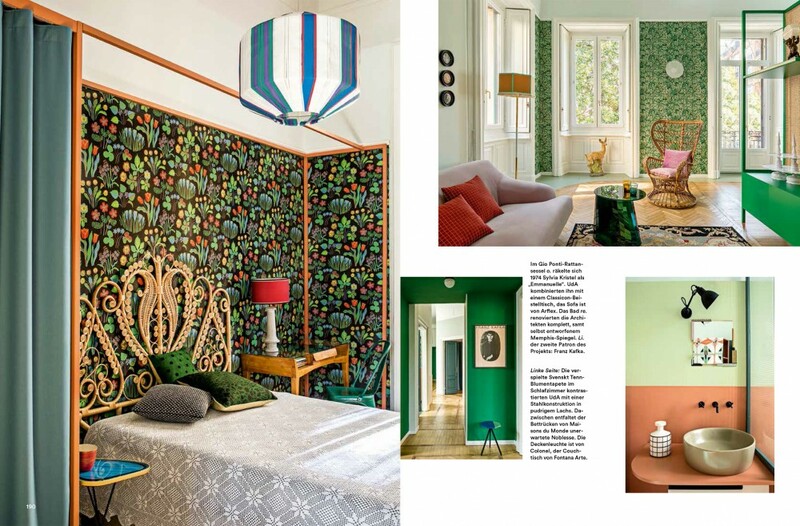 Opposite, the lush green jungle proliferates in front of the window and inside on the Fornasetti wallpaper. “Sometimes,” says Testa and smiles, “I think first of all what kind of tone I would least imagine at one point. Often it stays that way. “Because the two are looking for the non-eye-catching, what you need a second look. The matte khaki ceramics in one of the two bathrooms, for example, would be more likely to be expected in a 70s-era apartment – here it goes with powdery salmon, pistachio green and matte blue-gray safety glass an elegant and very contemporary liaison. And results in one of the typical Marcante Testa colour game, as they probably only can. “We control that, very closely in the 3D model” explains Adelaide Testa. Everything, every lamp, every carpet, every chair, is defined in advance. This is how Marcante-Testa first develop a language, then they seek the right words for the story they want to tell. No part dominates the others, nothing is “just beautiful” or “merely decor”. Everything works together, in between is a new life for the inhabitants – and a piece of rediscovered time.